Save up to 30% on 3 Day Special. Best rate guarantee! Only in Low season. Don't pass up this offer, Rent a Corvette Stingray today! Rent a Corvette Stingray in Fort Lauderdale at the best rates, Fort Lauderdale Auto Rental has the latest model. 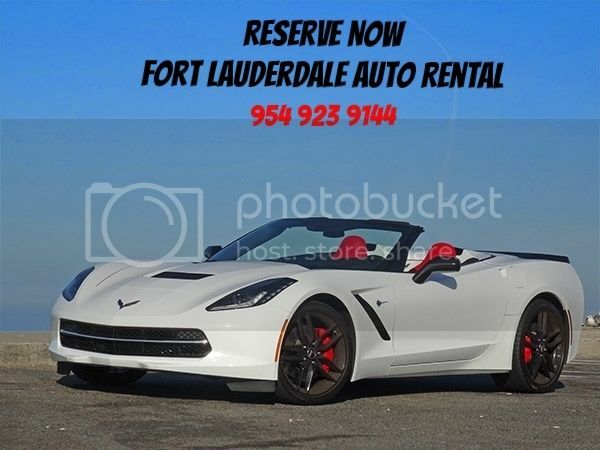 Rent a Corvette Stingray at cheap rental rates in Fort Lauderdale Florida, only at Ford Lauderdale Auto Rental. Daily, weekly and monthly at fantastic rental prices on Corvette Stingray. There is no better way to enjoy South Florida and The Key's beautiful year round weather then in the hottest sports car out.The Chevrolete Corvette Stingray Convertible has been completely redesigned, the optimal performance seats with leather stitching, and carbon fiber hood is just the beginning. Under the hood you'll find a redesigned 6.2 L V-8 engine offering horsepower and torque with 455 HP, 460 PFT, and a 7 speed automatic transmission. The convertible top on this vehicle is fully automatic and gives you a full sky view in less than 40 seconds. Every element of the 2015 Stingray makes it the quickest, most powerful, most redefined Stingray ever made.